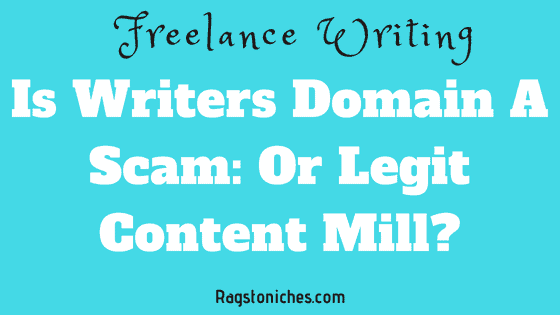 Is Writers Domain A Scam? Or Legit Content Mill? Today I’m looking into a content mill online called Writers Domain. I want to know whether Writers Domain is a scam or a legit freelancing opportunity. The emergence of the internet has provided budding writers an ever growing number of opportunities to make money from freelance writing. While many writers spend time building up their portfolio independently, some writers choose to work for content mills. Writing for content mills is a way to get potential clients to come to you, rather than having to seek them out and pitch to them directly. The main issue with content mills is, the pay is incredibly low. Many people would go as far to say it’s unethical to purchase from content mills, because you can’t even make a living wage. That said, writers who are just starting out, may choose to try out content mills before they go ahead pitching to clients directly. It can give them a confidence boost. Other people just like the convenience of content mills and if you’re a super speedy writer, you may be able to write a lot of content quickly and make a lot more than someone who types very slowly. Related Post: 5 Content Mills Like Textbroker That You Could Try! Maybe you’re not even familiar with content mills yet and are just looking into it – or maybe you just haven’t heard of this company before and are wondering if it’s a scam. I will share with you what I know about this platform and hopefully it will shed some light! Let me know in the comments if you’d like to share your experience writing for this company, or any other content mill. Money Making Opportunity: Freelance writing/part-time income potential. Overall Score: Legit. This company seems to pay a bit more than some similar sites, but it’s still going to be a low wage in comparison to what you could make independently. What Is Writers Domain About? Writers Domain was created in 2011, so it’s been around a good deal of time. At this point in time, you need to be native-level fluent in your language and reside in either: The US, Canada, UK, Australia, New Zealand or France. This is a writing opportunity, where you can connect with clients to write content for them remotely. The company produces thousands of pieces of content on a monthly basis. You can earn between $0.02 and $0.05 per word and you will get paid via PayPal. You will need to be competent at spelling and grammar and you will need to submit a writing sample and grammar test, in order to be considered. Writers Domain say on their website, that you should only expect this opportunity to provide you with a supplemental income, freelance writing in your spare time. You also must be 18 to register & any number of members from your household will be able to sign up. The writing jobs on offer will be first-come-first-served – so, while you won’t have to pitch, be interviewed, or provide any writing samples. However, you will need to be quick to accept writing projects before other people. How Do You Get Started With Writers Domain? 1/ Select your country of residence. You must be a native speaker to the country where you reside. 2/ Complete the registration form. This includes details like your name/address and PayPal email. You can also select your areas of interest, but this is optional. Click register and they will then send you an email to confirm and activate your account. 3/ Writing Sample & Grammar Test: You’re taken to the writing sample page. Here, it is suggested you read their writing sample guidelines, which they provide you with. They then give you some keyword pairings, which you must use these keyword pairings, write a title and write 400 words related to the topic. You need to write in the first person. 4/ Complete Grammar Test – According to some people, this grammar test is easier than some content mill related tests out there, like Textbroker. If you don’t pass, you can reapply, but not for 6 months. You should hear back within a few days. They also limit how many new writers they take on, so you may join a waiting list if you’re accepted. As mentioned earlier, you can earn between $0.02 and $0.05 per word. How much that equates to, is going to depend on how many articles you write and what the word count is. Typically, writers can earn between $15-$30 an article, depending on whether it’s premium or standard and this is not so bad, in comparison to other content mills. How much you earn will also depend on how well you have scored on previous articles. Clients are able to score you between 1 and 5 stars and how much you’re paid, will vary depending on what your average star score is. If you’re a 5-star writer, you will get paid $15.50 for a standard article, or $32.50 for a premium article. So, trying to maintain the best standard of work possible, will increase your earning potential. A smaller site, so it is not as competitive as other content mills – potentially giving you more of a chance to get work. Simple to sign up and get started. If you’re not a native speaker, you won’t be accepted. Clients can reject your work and you won’t get paid. You won’t earn much – but better than some sites! Writing domain is another platform you can use to earn a small amount of money online. To get the best chance of getting writing gigs, many writers sign up to a variety of platforms and then have a better chance at managing to find jobs. The problem with websites like this is, the work can be limited. As it’s first come and first serve, you need to be on the ball when it comes to checking for potential work available. Also, you have no control over whether a client rejects your work. Even writers who believe their work is good quality, can get their writing rejected – for something as simple as writing style and tone. If your work is rejected, you will have wasted your time. A good way to avoid getting rejected, is to take tasks which have very detailed descriptions. The more information you have about a project and how the client would like you to complete it, the better chance you have of doing a good job and being rated well. Some freelance writers make an amazing income online, although it’s not from writing for content mills. For example; a well-known online success story comes from Gina Horkey; who managed to make $4000 a month just six months after quitting her job. Clearly the potential to make money from Freelancing is there, but it’s not always obvious how to get started and many people don’t have the money to pay for courses, or have the confidence to pitch to people without experience. So, content mills can be a way to test the water… Just be aware that you won’t be making a huge amount from writing for sites like this. Making More Online – Fed Up Of Exchanging Your Time For Money? There is a major flaw in exchanging your time for money… That is, once you stop working, the money stops too. You may feel great that you’re making a few hundred dollars a month from writing online – but, once you stop, so will your income. This works the same way in any type of employment, (aside from paid holidays and sick days…. which you don’t get with freelancing!). One way you can stop exchanging your time for money long term, is to build your own business online. If you’re interested in making money from freelancing, you could start a blog, or website in the freelancing niche. You could share your story, tips and tricks for getting writing jobs and promote online tools and courses. There are many ways that you can earn from a blog once it is established. The great part is, you can earn from content you post into your blog months and even years into the future. Some of the posts I wrote months ago, continue to bring thousands of visitors to my website. The more people you have come and check out your content, the more income potential you have and you can continue to grow that over time – this leads to an income you can continue to generate even when you take a break, even when you’re not working at all. I’m sure that all sounds great, but I will say that it is not as easy as many people claim it is! It takes hard work & dedication…. But all the best things do, don’t they? Let me know if you have any advice regarding freelancing, or whether you have had much luck writing for content mills. Want To Start An Online Business That Requires Low Investment & Minimal Risk? Start Here. I am interested, but… I am a Canadian citizen, I have a Canadian address, all the relevant Canadian ID and tax info… except I am travelling quite a bit. can i work for this company remotely? Right now I am in Vietnam and will be for 4 more months then I will be in Cambodia for up to 6 months. will they reject me based on my IP address, or is my Canadian ID and info sufficient to get considered?